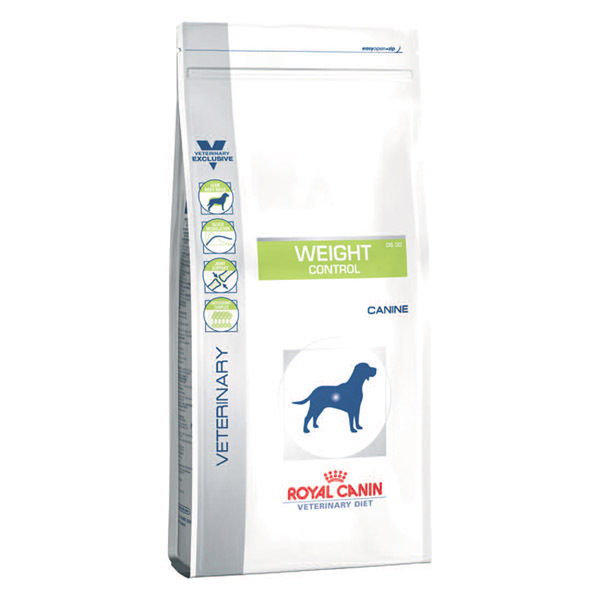 Royal Canin Weight Control (DS30) is a dietetic support food for dogs that are prone to weight gain, have diabetes, hyperlipidaemia, colitis or constipation and is a particularly good diet for dogs following a weight loss program. The food contains a balanced blend of key nutrients for health and vitality and tailored ingredients to help your dog maintain a desired weight. With blended L-carnitin, rich proteins and low glycaemic barley and corn to reduce the risk of gastrointestinal reaction. Joints will also be supported by advanced levels of chondroitin sulphate and glucosamine which will nourish and protect tissue that has been subjected to stress from having to carry excess body weight. Complete feed for adult dogs over 1 year old. Lean Body Mass - High protein content to help favour maintenance of lean body mass. Moderate Calorie - Moderate calorie content to help combat excess weight gain. Dehydrated poultry protein, barley, maize flour, maize gluten, vegetable fibres, beet pulp, hydrolysed animal proteins, animal fats, minerals, yeasts, fish oil, fructo-oligo-saccharides, psyllium husks and seeds, hydrolysed crustaceans (source of glucosamine), marigold extract (source of lutein), hydrolysed cartilage (source of chondroitin). Protein: 30% - Fat content: 10% - Crude ash: 6.3% - Crude fibres: 6.7%. The following table shows the recommended daily feeding guidelines (grams/cups per day). Fresh water should be available at all times. Below are some recent questions we've received regarding Royal Canin Canine Veterinary (Clinical) Diets Weight Control Dog Food, including answers from our team. 17 month old Labrador with dysplasia and overweight. Feeding advice! There is no easy answer to weight control for dogs like this. This weight control diet is perfectly good enough for his joints. As far as controlling his weight is concerned, the diet will not do that by itself. You will have to restrict the amount you give. If you feed him the correct amount, he will be the correct weight. If you give too much, he will eat it very happily, but be too fat. If you give him not enough food he will be too thin. Therefore you should forget all the feeding guides provided with the food and just judge it sensibly on your dog. If he is putting on weight, you are giving too much food, so reduce it. It really is as simple as that. You can certainly end up with a dog of perfect weight on the food you give, but he will always be hungry. But then that is part of being a neutered labrador, so you will have to accept that, or just let him get fat. Many people do, because they are not up for the battle of restricting the food to keep their dog's weight down. The only other thing to add would be that it seems that the high protein, cereal-free diets seem to keep dogs more satisfied and so less greedy. You can restrict the amount you give while not leaving them feeling quite so hungry. These diets are more expensive, but that is how it often works. Orijen is the classic example of such a diet, but there are lots of copy-type brands now - the "grain-free" diets in American parlance. Personally I would ideally choose Orijen dog food.